I am just starting out in the cabinetry business and have a 4x8 CNC machine in my garage to cut case parts and slab doors, etc. I can have a separate company do PVC edge banding at $65/hr + materials. My question pertains to pricing. I am in the Raleigh, NC area and recently was awarded a cabinet refacing job in several dentist offices in the state. I want to check with you guys to see if I am even in the ballpark on price. This has turned into far more work than I anticipated, but I know my process organization (or lack thereof) has something to do with it. I am in the middle of the project now. 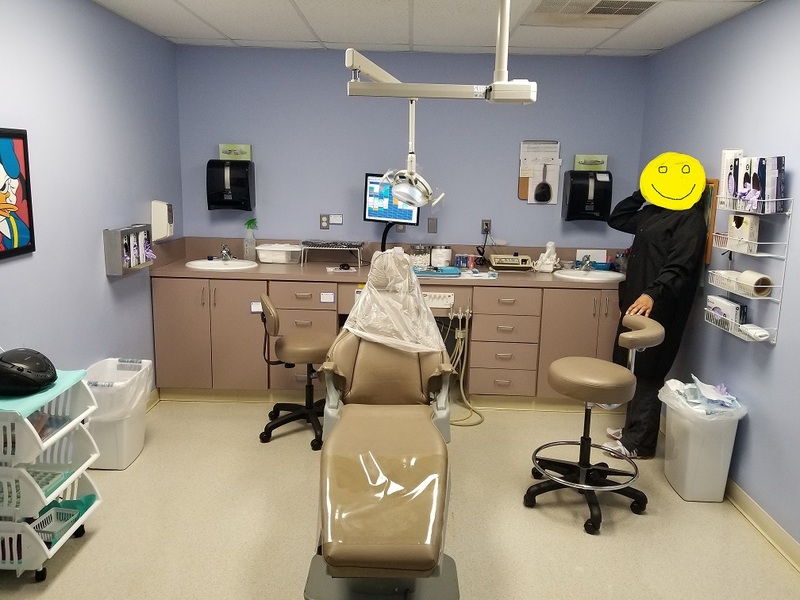 Example: Dentist office with 12 exam rooms. Each room has 11 feet of Nevamar laminated frameless base cabinets with matching countertops and 6" side/backsplashes. See photo attached. The cabinetry is symmetrical left to right in the room, with 4 doors total and 8 drawers total per room. Counters are MDF (double layer at the edges for height) and the doors/drawer fronts are particle board with P-lam/cabinet liner. 8 of these rooms need to be completely refaced, including the edge banding on the carcasses and the counter tops/back splashes/side splashes (the color of the laminate needs to be changed). The other 4 have some damage, needing a total of 5 doors and 5 drawer fronts replaced due to water damage. The counters are being replaced in 1-8 rather than re-applying a new laminate. All of the drawer fronts are attached to metabox style boxes. BLUM euro hinges attach the doors. All hardware will be reused. For all of this work, including installation, demo, and disposal: around 10k. I know everyone has a different situation and should charge differently, but I want to know if I am way off. Thanks in advance, I have already learned so much from the folks on this forum! Thanks Rich. Sounds like I am too low then. Care to quantify? Give me a multiplier maybe? Thanks! We always replace doors and drawer fronts, the field labor for us is very expensive. We replace tops if they are damaged. With all the Air quality controls for onsite work using adhesives in occupied buildings is a PITA. Sometimes double stick tape, sometimes WA recover laminate. Trying to relaminate and repair water damaged laminate tops is a useless exercise IMO. Mobilization per site or per room or per day depending on how many you get done in after hours or weekends or a day if the business is occupied. Delivery costs if you can store onsite. Thanks Alan. This is all after-hours weekend work. It took me far longer than I imagined to do just 3 of the 8 rooms. The time on-site is where I am getting burned. I won't be going back until next weekend, and I have their expectations much much lower on how far I will get. Luckily, they allowed me to leave the finished counter tops there out of the way. those things aren't light by the way. I am using the EZEE EDGE edge banding from EdgeCo and that seems to work well, especially on the carcasses. The only glue on site is for those side panels behind that center panel in the picture. Last time I was there, I was peeling the old back and then sticking the new lam on with roll-on wilsonart glue. This time, I think I am going to use my belt sander and scuff the old laminate, clean and then use aerosol glue to stick the new laminate on. That might not be the best method, but I find that ripping that old laminate off takes a lot of time and energy unnecessarily. There are a few other things about my process I am going to do differently when I return. I figured pricing based on square footage of doors, drawer fronts, and counter top. I also charged separate for edge banding by the foot. I think I can use the pricing method I have, but I need to raise the price somewhere. I had a feeling I was off when the manager called me in to tell me he thought it was too low an estimate, but that he had already submitted it for approval! We always bid after hour and out of town work in 8 hour increments, generally we won't send a guy alone for safety reasons after hours so we would estimate rooms as what two men could do in a single day so if you though it was 11.5 hours for two rooms I would bid 16. Then I bid for the delivery guy to work after hours and if we need to haul off old items he has to stay so he helps. We like to pick up fronts when we can so we don't have to measure and check every thing. We have done a lot of this as part of remodels where they buy new and also when they redo a lot of rooms. Its never cheap for us, all you can do is develop methods that are fast to install. From a cost stand point we offer options to not re edge the cases if the color is the same or similar, to not do exposed ends or the underside of uppers. every market is different but remodeling cabinets in the field is not always cost effective. If all the rooms are the same there is a lot of efficiency in making all the replacement parts at one time and you could do all the edging and re-laminate at one time and all the replacement fronts at another time so each trip into room is using all the same tools and doing the next room the same. I just see this job as a mess. I would have priced it as a tear out and new replacement. It likely would have been cheaper and better quality since you would have been working in your garage. Just look at the hours you are going to burn up with controlling dust, drop clothes, and cleanup after each work session! Reusing hinges will almost certainly result in a call back in a few years. Hinges don't have the longest life in commercial applications. Now it's going to get painful since you are locked in at that price. Next you get to do it somewhere else in the state and pay for more travel and lodging I guess. I've had hell jobs, this one has all the potential of being a life long bidding lesson for you. With 8 rooms ask to close two at a time, demo tops and front, have customer remove stuff, plam cabinet edges, install new top and splash then fronts, Keep tight with schedule and you could make money but the most profitable work will be done in the shop not the field, we have a local guy who loves this stuff, got him doing cabinets in two banks while i replace greeter and teller lines, works for me ! Being in Raleigh if you specialized in this and take the lesson of losing money you probably will find far more work than you can handle, contact the building maintenance dept of hotels, hospitals and colleges, give them something to hold like a good flyer, website, ask for an email address and contact them reasonably often, chances are you may just make some money, you can also contact larger millwork companies,, we look at the referral when we don't want it as keeping the customer. Rich, you are probably right about those hinges failing, although I was surprised to find that most of them are still tight after being in service almost 20 years. I think it's because those doors are rarely opened. The drawers get used a lot but not the doors. If the hinges fail and I get called back, I will be sure to charge accordingly. Changing them was not part of the original deal! Another thing I didn't mention is that they are cooperating with removing items from the rooms and then returning those items back the following work day. I way overestimated how far I would get last weekend so there were 8 rooms cleared but I only got to 3 of them. That bummed some people out having moved all that stuff for nothing! As for continuing down this path, I am not so sure I want to! Someone has to work in the cabinetry trenches though I suppose! I prefer the residential kitchens and baths for sure. For templates I brought some old drawer fronts back with me to use as a template. Thanks for the advice, a website is on the list. I have the domain just have not found the time to build it yet! Dylan, we have been there. Just do a good job and get through it. And don't mention or complain about bidding to low to the owners. I just wanted to add that recently my eye doc had a remodel done and I had an appoint. There was dust in the corners and the nurse said they had to wipe counters and equipment down every morning. What a tough way to start your day and it just looked unprofessional. Poor planning on someone's part. I did some work on a riverboat gambling casino decades ago. Now those were crazy working hours. If I remember right, 2:15 am to 7:30 am. 7 days a week. They had to pay dearly for that work shift, but they didn't bat an eye.